The EOS 20D's menu system has a very similar layout to the EOS D30/D60/10D apart from bringing it a little more in line with the appearance of the latest PowerShot digital cameras. The menu is still split into three categories (red, blue, yellow) which is indicated by the colored scroll bar down the right edge of the menu. You can press the JUMP button to skip to each section.  On Enables the use of the AF / red-eye lamp just before a flash shot.  Off Enables auto focus confirmation beep. Also used for self timer.  Off Allow shot to be taken without CF card inserted.  1/3 or 1/2 EV steps (C.Fn 6) Configures auto exposure bracketing.  Bracket: BA+/-3, MG+/-3 Configures WB shift and WB bracketing. [clip]  Set custom WB Select image for custom WB. Color temp.  2800 - 10000 K in 100 K steps Select Kelvin WB temperature. [clip] Protect mode, allows you to browse images either in a single image or thumbnail view and mark each image as protected (or un-protect). This simply sets the read-only flag on the CF card filesystem. [clip] Rotate mode, again, this can be performed in either single image or thumbnail index view. This option allows you to rotate an image on-screen by 90 or 270 degrees. Doesn't actually rotate the JPEG file, but marks its orientation. [animation] Allows you to create a DPOF print order file, this defines which images will be printed, how many copies of each, what format etc. For use with compatible printers or photo finishers. 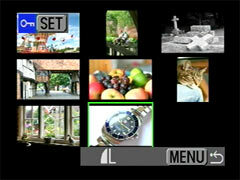 [clip] Start an automated slideshow of images on the CF card, delay between each image is preset at four seconds. 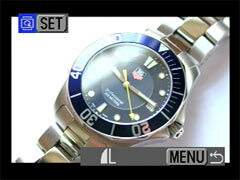 Review time * Select the record review time: 2, 4, 8 sec or Hold (as long as the shutter release button is held down). 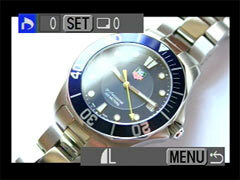  Off Sets camera power off time, this is the amount of "idle time" before the camera powers itself off. In the power off state the camera can be woken by half or fully depressing the shutter release (or turning the power switch to Off and back to On).  On When enabled the camera will display shots taken in the vertical orientation rotated. LCD Brightness  -2 to +2 Sets the LCD backlight strength.  Auto reset Controls the numbering method used for filenames.  PAL Select video system for video out connector.  PTP Sets USB communication protocol. 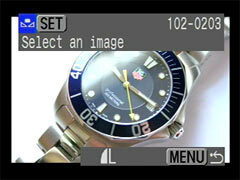  OK Select OK to flip up the mirror and open the shutter to allow you to clean the sensor. Power Off once done. "Can't adjust continuous shooting frame rate (always 5 fps)"
Oh don't worry. It will do that for you. This camera falls back to 3FPS all the time. The main thing I want from camera performance is to not notice it, and the Canon EOS 20D passed that test. It shot when I wanted to shoot, focused when I wanted something sharp, and let me look through images quickly when it was time for a break. With the 20D, I never had to waste time and miss shots waiting for the camera. "let me look through images quickly when it was time for a break"
No, that's not the 20D. Scrolling through images was painfully slow like on the 300D/350D. This was corrected with Canon's next enthusiastic models, the legendary 5D, and the soon-to-follow 30D. Thay had larger screens and MUCH faster image playback (in the order of 3x-5x faster). Why do I know it? "I was there, at the dawn of the third age of mankind..."
I've sold my 40D long time ago, but i do still have my 10D, 20D, 30D & 50D. The 20D is the no-nonsense grab & go cam, with the 18-55 STM, and for locations i'd been concerned about security, and to shoot with a newer, better DSLR & lens. Compared to the 30D, with the same sensor, there isn't much missing, the 30D does have a bigger LCD, but it does have some greenish color cast. I do anyway don't look at the shots on the DSLR, but at home on my PC, might have a look for histogram only. Only drawback really compared to the 30D & newer: 8 GB CF Card Limit. Even with FW 2.0.3, the 20D only recognizes 8GB from a 16GB CF Card. But even for RAW, it's plenty of Space, because the 20D does only have 8 MP, and the files aren't huge. marc petzold, another reason the 8GB limit isn't an issue is because the 20D has only a small buffer (roughly 23 large JPEG) and only 3-5FPS. "no-nonsense grab & go cam"
It might be, if it had auto-ISO, like so many Nikon cameras. When did Nikon get that feature? Get the 40D! I've re-bought a 40D into Fall last year...going with my 10-18 STM, or 55-250 STM. 14-bit RAW files, and good color, tonality. It was a bargain. 40D does feature AutoISO, imho. But i am not using that feature. PS: I never do continous shooting, only AF-S, shooting static objects, landscapes, etc. marc petzold, thanks but I already have the Canon 7D and I am addicted to the 3 custom modes on the mode dial. I also prefer the reduced visual noise. When there is visual noise the 18MP allows me to hide alot more of it, using pixel binning. I can't imagine anything that would persuade me to use the Canon 40D over the Canon 7d. However, I still use my 20D and 400D for photographing lightning.